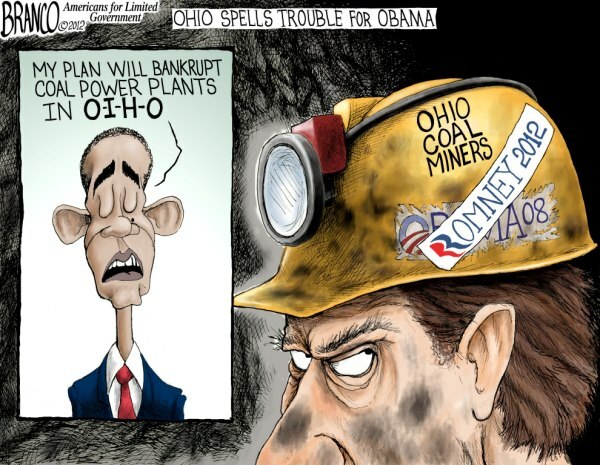 Coal miners are hitting back at Barack Obama for what they call "mistruths" about them and want him to stop running "false ads" about their genuine support for Mitt Romney by claiming they were forced to attend a Romney campaign event in August, calling Obama's ad "blatantly false." Coal miners at the American Energy Corp. Century Mine said they want President Barack Obama to stop what they term "the war on coal" - and to stop spreading "mistruths" about them. Miners gathered Friday afternoon to express their opposition to Obama's energy and environmental policies, which they believe threaten their jobs. Miner Mitch Miracle read aloud a letter the miners mailed to Obama that outlines some of their concerns. 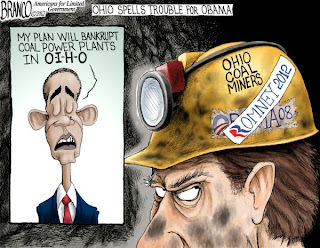 The miners said Obama's campaign team is running ads filled with "blatantly false" statements about the miners regarding their participation in Republican presidential candidate Mitt Romney's August campaign stop at the Century Mine. These ads assert that the miners were forced to attend the event by the mine's owner, Robert Murray. "There are numerous false statements and absolute lies concerning our participation in this event, mostly started by a local 'shock jock' radio host," the miners' letter to Obama states. "Why would you (Obama) lie about the 500 working miners who have signed this letter? We, the employees of the Century Mine would request you immediately stop these false ads." This summer, Murray Energy Corp., parent company of the Beallsville mine, cut or relocated 56 workers with the closure of the Red Bird West mine near Brilliant. Murray also cut 29 mining jobs from The Ohio Valley Coal Co.'s Powhatan No. 6 Mine. All of this was done, Robert Murray said, because of Obama's "war on coal." - No employee was forced to attend the event. - There were no attendance records taken for hourly employees. - There were absolutely no penalties or reprimands to those who did not attend. - Due to security concerns for the Romney campaign, there was a list for transportation purposes. - They were "honored" to host Romney at the mine. As for anyone who claims the miners were forced to attend, those on-site Friday said these assertions probably came from "discharged or disgruntled former employees." Despite the miners' Friday statements, Ohio Democrats have requested a federal investigation regarding Murray's campaign contributions and practices. The letter is just one part of how the coal miners are fighting back against Obama as "United for Coal rally set to unfold in Appalachia." WISE, Va. (AP) - Friends, families and business operators who depend on coal mining are lining up along highways in Kentucky, Virginia, West Virginia and Ohio. Thousands of miners have been laid off across the region this year, and the United for Coal demonstration Saturday is a grass-roots effort to show solidarity for those who are struggling. It's also intended to send Washington, D.C., a message that coal country is a political force to be reckoned with. If all goes as planned, lines will form along U.S. Highway 23 from Big Stone Gap, Va., through Paintsville, Ky., and toward Chillicothe, Ohio. They will stretch north on U.S. 119 from Pikeville, Ky., toward Williamson and Charleston, W.Va.
A free concert is set for Pikeville, where some 50,000 are expected. United for Coal can be found online HERE. Coal Miners, Conservatives to Hold Press Conference in Harrisburg to Stop Obama's "War on Coal"
HARRISBURG, Pa. , Oct. 12, 2012 /PRNewswire-USNewswire/ -- FreedomWorks for America will join conservative activists and a group of coal miners from Western Pennsylvania to hold a press conference calling for President Obama to stop his "War on Coal." With high unemployment, high gas prices, and rising costs of utilities, Americans cannot afford four more years of President Obama and liberal Senate Democrats like Bob Casey . Speakers will include: Co-Founder of the Kitchen Table Patriots Anastasia Przybylski, FreedomWorks fellow Tom Borelli , Outreach Director Deneen Borelli , former PA State Senator John Pippy, grassroots activist Mark Fischer and coal miner Gary DuBois . WHEN: Tuesday, October 16, 2012 from 2-2:30 p.m. ET , including Q&A following the prepared statements. WHERE: Harrisburg Capitol Rotunda, Harrisburg, PA.
WHY: The purpose of the press conference is to raise awareness of the Obama Administration's harmful energy agenda and burdensome regulations that continue to reduce America's demand for coal as a clean energy resource. FreedomWorks for America believes excessive regulations on energy production are harming the living standards for hard-working Americans, including coal miners and their families. For more information about FreedomWorks for America, please visit www.FreedomWorksforAmerica.org. 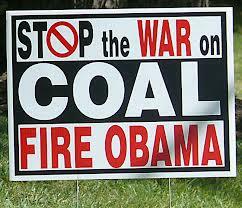 Coal miners are tired of Obama's war on coal which is a war on them. [Update] Gateway Pundit links... thanks! !